Providing you the best range of nc/cnc shearing machine, fixed rank angle shearing machine, hydraulic shearing machine, under crank shearing machine, mechanical over crank shearing machine and variable rank angle with effective & timely delivery. Kawa introduces now premium and state of the art metal forming machinery both for capital good and consumer durable industries. 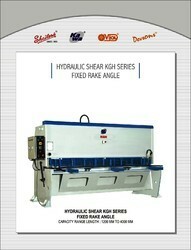 are now overtaking conventional mechanical shearing machine's due to its lower maintained cost and versatility. Shailesh introduces now Fixed Rank Angle Shearing Machine and state of the art metal forming machinery both for capital good and consumer durable industries. are now overtaking conventional mechanical shearing machines due to its lower maintained cost and versatility. The hydraulic Power pack unit is with pump, motor and valve with block assembly are conveniently located in the back upper part of the frame with the oil reservoir all necessary a hydraulic valves are mounted on the compact designed manifold block The Large size of the oil reservoir is provided for adequate cooling and increases of oil life. All the Components are used of reliable and reputed internationally available brands. Manual blade gap adjustment is standard on all models, with the lever and calibrated scale for various thickness on both sides of the machine to adjust the clearance between top & bottom blade According to the sheet thickness. Motorized/Hydraulic blade gap adjustment is available as an option. Motorized / hydraulic blade gap adjustment is provided as the option and is operated by push button control and through plc. Controls. 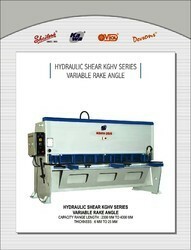 Shailesh introduces Variable Rake Angle Shearing Machine incorporating latest manufacturing technologies with the capacities ranging from 4 mm to 25 mm and lengths from 2000 to 4000 mm with several optional features like motorized blade gap adjustment, ball transfers, extra long squaring arm, front sheet support, auto lubrication, auto adjustment of cutting force, and also CNC control systems to make the operation completely automatic. The frame is of heavy duty design and hot rolled welded steel plate construction. 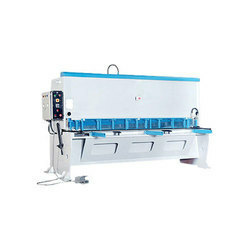 The shearing table is Integral with the basic machine frame to ensure maximum rigidity. The hydraulic Power pack unit is with pump, motor and valve with block assembly are conveniently located in the back upper part of the frame with the oil reservoir all necessary hydraulic valves are mounted on the compact designed manifold block The Large size of the oil reservoir is provided for adequate cooling and increases of oil life. All the Components are used of reliable and reputed internationally available brands. The control panel is conveniently mounted on the left-hand side of the machine to ensure ease to operate when working from the squaring arm end. The panel house push-button controls for the motor on/off, rake angle position setting, to select operating mode single or inching/continuous shearing operations. And optionally provided motorized back gauge control with digital readout display unit and push button control for motorized/hydraulic blade gap adjustment when optionally provided is also situated on the control panel. The shears have the 2-operating mode. The selector switch is provided to select single or inching/continuous shearing operation. The length of cut is infinitely adjustable and it can be selected to provide optimum production output for the length of blank to be sheared. And avoid unnecessary blade wear. The optimum rake angle is set via a selector switch at the control panel and allows for selection of the correct rake angle to suit the material being sheared. By increasing or reducing the angle, a semi blanking action is obtained to give minimum distortion of the sheared blanks. Manual blade gap adjustment is standard on all models, with the lever and calibrated scale for various thickness on both sides of the machine to adjust the clearance between top & bottom blade According to the sheet thickness. Motorized/Hydraulic blade gap adjustment is available as an option. Motorized/hydraulic blade gap adjustment is provided as an option and is operated by push button control and through plc. Controls. All Shailesh Shears are equipped with manual Back Gauge arrangement. As an option motorized Back Gauge, Motorized 2-speed back gauge with D.R.O. The Motorized Back Gauge is operated from the control panel and dimension being read from the Digital Display. LED type and NC Back Gauge can be provided. On the heavy model, the retraction type Back Gauge arrangement to allow the plate to fall away freely after shearing. And any other automation also available through plc. Controls. Shears are equipped with shadow line lighting to facilitate shearing to a scribed line. Shailesh-Shears are fitted with a set of hydraulic hold-down jacks, clamping force of hold-down jacks is automatically adjusted according to the cutting force required, allowing for higher pressure Clamping for thick material while at the same time clamping thinner materials without marking. Precision engineered, our range of Under Crank Shearing Machines is fabricated using the high-grade raw material, procured from the trustworthy sources of the market, assuring faster operations. Catering to the varied needs of several industries, these machines are well reckoned for their durability, reliably and low maintenance cost. Clients across the nation, as well as international markets, can avail these products at highly affordable prices. Clients can avail from us a wide assortment of Mechanical Over Crank Shearing Machine at industry leading prices. The entire range of these machines is fabricated as per the market requirements and can be availed cost-effective rates. These machines are stringently quality tested assuring a flawless delivery at the clients end. Assuring long service life, high resistance to corrosion and low power consumption, our entire product range is largely appreciated by clients across the globe. Being a well-established organization, we are engaged in offering a distinguished range of Variable Rank Angle Hydraulic Shearing Machine. The provided machines are designed and developed through years of experience using sheet metal working machines and are widely accepted in industries for continuous production and in areas requiring accuracy coupled with high production.